On our way home from school … my kids asked for breadsticks. Actually, my oldest two asked for breadsticks. And “not the kind that Olive Garden has” either, because according to my 9 year old, Olive Garden doesn’t know how to make breadsticks. Who knew? I always thought theirs were pretty good – apparently my kids have different opinions. I wish I could convey just how easy these are – terribly easy, light, fluffy and soft breadsticks. Perfect to dip in marinara sauce and eat on their own – or, pair with a bowl of spaghetti/pasta. 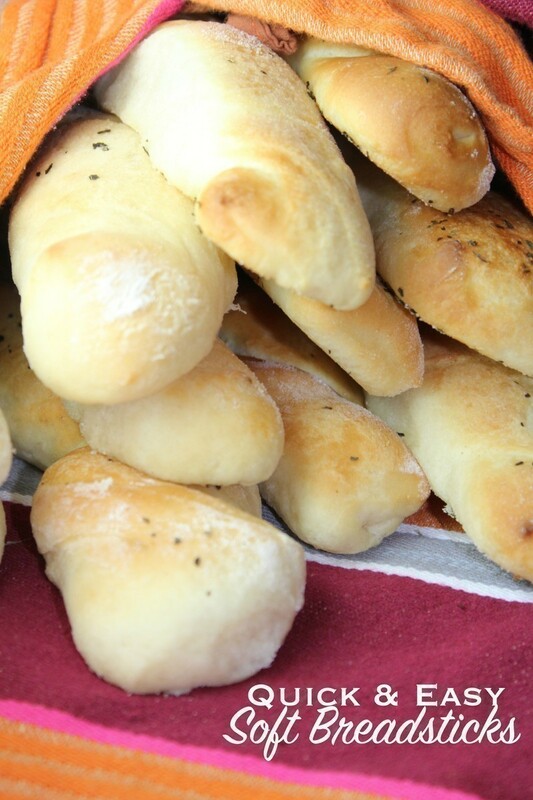 Deliciously soft, fluffy breadsticks that are SO fast and easy to make. In the KitchenAid, add the water and then yeast. Let it sit and "proof" about 5-8 minutes.. you should see it foam up on the top if you have the yeast at the right temperature. Add the Brown Sugar, Salt, Oil, and Flour - and mix well with the hook attachment - 3-4 minutes. Once mixed it should become very elastic - turn off the mixer. Prepare 2 baking sheets - lay your silicone mat on each and lightly dust with flour - set aside. Lightly oil your hands with Olive Oil, and pull the dough from the mixing bowl. Form into a ball and knead lightly for 1-2 minutes on a lightly floured surface. Lay the ball of dough on the bigger cookie sheet and roll into a 10x12 rectangle. Cut into strips with a pizza cutter, and give each a twist. Garnish with Basil, and sprinkle the dough with a little garlic salt (to taste of course), and let rise for at least 15-20 minutes. Using a pastry brush, lightly brush each stick with melted butter and add any additional seasonings before they bake. Bake at 375 for 10-12 minutes or until light brown. Store in a covered container - though they usually don't make it that far. These are so extremely easy & foolproof – you can add any herbs of your choice, garlic salt as needed or even use Bread Flour instead of All Purpose Flour. The longer you let them sit the more they rise – but if you are short on time they’ll still turn out terrific, too!